One of these most striking locations near Thiruvananthapuram is the picturesque hill station of Munnar where the undulating slopes thickened with lush greeneries offer some of the most scenic views amidst an opulence of the charming natural splendors. 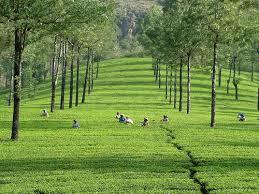 It takes only a little more than 6 hours of a drive to reach Munnar from Thiruvananthapuram by road. Positioned about 278 kilometres away from the town of Thiruvananthapuram, Munnar is a picturesque hill station where visitors from near and far arrive to enjoy weekend trips. Most of these tourists travel to Munnar via the major cities of Kerala, which include Thiruvananthapuram, a short drive being the ideal means to get in Munnar from these cities. It is in fact the best option for the sightseers to enjoy the breathtaking views of the roadside setting along the way to Munnar. If the visitors drive their own car up to Munnar it saves them time and money as well. However, regular bus services that are offered directly to Munnar from Thiruvananthapuram are also available, the bus fare being quite affordable though it takes more time to get at Munnar by a bus than by a private or a rental car. KSRTC buses ply regularly along the road route from Thiruvananthapuram to Munnar taking about 8 hours 15 minutes to cover the distance of nearly 278 Kilometres between Thiruvananthapuram and Munnar. Fare for the KSRTC buses plying daily from Thiruvananthapuram to Munnar is around Rs 525 per person. On the road route via the Main Central Road from Thiruvananthapuram to Munnar the visitors should travel towards the northeast direction up to Housing Board Thampanoor Road and then from the roundabout, which comes next at a distance of about 60 metres, the travellers should start moving on the Thiruvananthapuram Bakery Palayam Road moving past the Thampanoor Police Station on the right hand side of the road. After a distance of around 1.3 Kilometres the visitors need to turn a little right and continue moving on the Bakery Flyover. At a distance of about 650 metres comes the Palayam Underpass after they move past the University Library on the left hand side of the road at a distance of 450 metres. At Aasan Square they should continue along the 4th exit and leave the roundabout at a distance of 120 metres moving past the University Library on the right side of the road. From the roundabout they should turns left onto the National Highway 47/ Palayam PMG Road at 300 metres. The route then continues along the roundabout to the 2nd exit onto the Main Central Road at 3 Kilometres past Vijaya Bank, past Lutheran Church on the right along the Main Central Road and at 11 Kilometres turns left at Vembayam. After a distance of 38 Kilometres the route continues on the left at LMS LP School continuing past the IOC Petrol Pump. The road to take for Munnar after leaving the roundabout is the Sasthamkotta Road, which is also called the State Highway 37 or NH 183A and after continuing past the Geo Graphics a sharp right at Adoor Central turns the route to Kayamkulam-Pathanapuram Road after the park comes on the right the route continues along the Adoor-Anandapally-Thumpamon Road, which also known as the Adoor-Kaipattoor Road. The route further continues along this road after the Sreyas Book Centre to the right from Andappalli Junction and then again turns left to the Adoor-Kaipattoor Road. After leaving St. Georges Church on the right the route continues to the left along the same road and after driving past the Government Vocational Higher Secondary School on the right the travellers should take the 2nd exit at the roundabout and continue along the same road. After leaving the Real Bakers at the right hand side they need to turn left to get on the Ring Road, also known as the State Highway 7 or the Thiruvalla-Kumbazha Highway. On the right comes the Indian Oil Petrol Bunk and then the route moves left up to NH 183A. Continuing along the NH 183A the route again moves left from the St. George Auditorium up to State Highway 8. From there moving past the St. George Orthodox Church, which comes on the right, the route moves right from Thulamannil Textiles and continues on State Highway 8. Ranni Gas Station comes to the left of the road and at Beauty the route moves left. After moving past the Manimala Service Co-Operative Bank that comes on the right the route moves to the right. After leaving the St. Mary’s Church on the left at Cheruvally the route moves a little right and continues on the Kanjirappally Manimala Road. Mar Aprem Medical Centre comes on the left and then the route moves right from St. Martin de Porres along the Kanjirappally Manimala Road. After moving past the Kallinkal Rubber Factory that comes at the right hand side of the road, travellers need to turn a little right at Sahrudaya Public Library up to the Kollam – Theni Highway, also known as the National Highway 220. The Hindustan Petroleum Pump comes to the left and then the route moves left from Arabian up to State Highway 44. The MAM Hospital comes to the left and then at Muttam JCT the route moves right. After moving past the HP Petrol Bunk the road turns right from the KSRTC Junction up to Moopilkadavu Bridge. The 2nd exit from the roundabout shifts the route to Munnar right up to the Alappuzha-Madurai Road, which is also known as the Thodupuzha-Udumbanoor Road. After the De Paul Junction, which comes on the left, the route continues straight from the roundabout along the Alapuzha-Madurai Road. At the next roundabout, the travellers should exit it and continue moving along the Alappuzha-Madurai Road. On the left they would get the Thodupuzha Urban Co-operative Bank Ltd and from they should move left and continue moving along the same road. After 4.3 Kilometres of distance the road moves left and after the Kaliyar Estate Hospital comes to the right the route moves right from the Mobile House and continues along State Highway 43. The State Bank of Travancore comes to the right and the route moves left on the same highway. The St Thomas Orthodox Church comes to the right after a distance of about 9.4 Kilometres. From there the route moves left up to the Keerithodu-Vannappuram Road at a distance of about 12 Kilometres. After 1.2 Kilometres of distance the route moves right and continues along the same road moving right up to Kallarkutty Pambla Road after a distance of 750 metres. The route moves left from here at a distance of about 900 Metres andthen moves right from the Forest Check Post up to the Kallarkutty Dam Road. The Panamkutty Bridge comes to the right at 750 Metres and the route moves right up to Adimali-Rajakad Road after about 5.2 Kilometres. 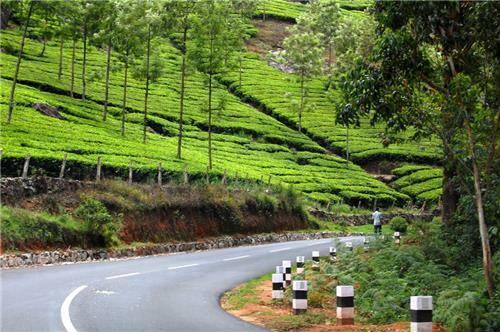 After a distance of 1.8 Kilometres the route to Munnar moves to the left up to Thottapura-Selliampara Road. The Primary Health Center comes after 3.2 Kilometres along the route, which moves right towards the Chithirapuram Powerhouse Road after a distance of about 5.8 Kilometres. The route continues along the same road for 5.3 Kilometres and moves past the Bellavista Resorts Munnar at a distance of another 350 Metres. Moving a distance of 1.1 Kilometres from the Bellavista Resorts Munnar, the route moves left to Aluva-Munnar Road at Evershine Holidays. Aluva-Munnar Road is also known as the State Highway 16 and National Highway 49. At a distance of about 2.7 Kilometres the route shifts to right and the C.S.I. Church comes next on the left at a distance of 7.4 Kilometres. The route then shifts to the left at KDHP House towards State Highway 17, known as the Munnar–Udumalpet Road. After a distance of 8 Kilometres GVT comes to the right of the road and finally the tourists get at Munnar.